(b) Descriptive Roll / Identification Documents with Photographs. 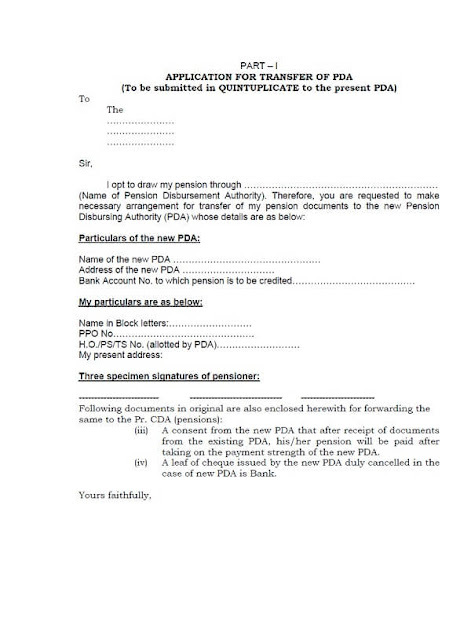 (iii) A consent from the new PDA that after receipt of documents from the existing PDA, his / her pension will be paid after taking on the payment strength of the new PDA. 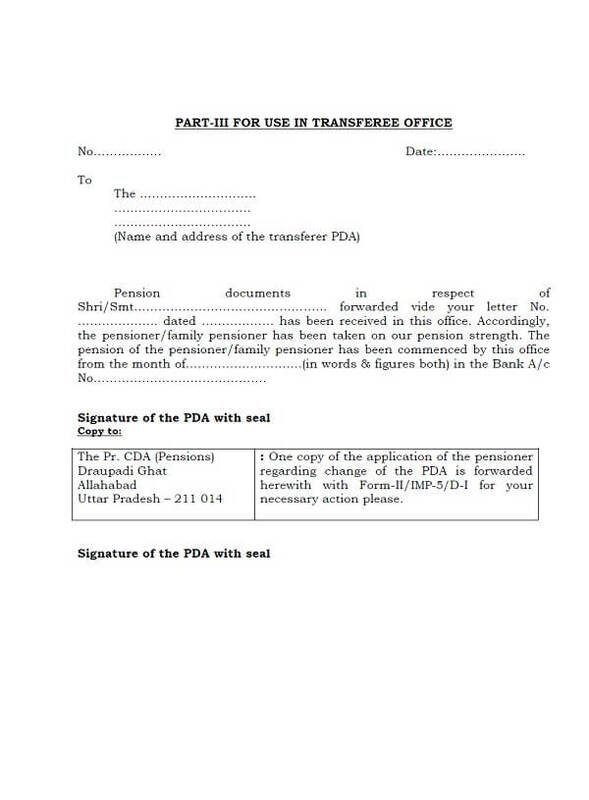 (iv) A leaf of cheque issued by the new PDA duly cancelled in the case of new PDA is Bank. Pension Payment Order/PC (Original & Corr.) No .. .. .. .. .. .. .. .. .. .. .. .. .. .. .. .. .. .. .. .. .. .. .. .. .. .. .. .. .. .. .. .. .. .. .. .. .. .. .. .. .. .. .. .. .. .. .. .. .. .. .. .. .. .. .. .. .. .. .. .. .. .. .. .. .. .. .. .. .. .. .. .. .. .. .. .. .. .. .. .. .. .. .. .. .. .. .. .. .. .. .. .. .. .. .. .. .. .. .. .. .. .. .. .. .. .. .. .. .. .. .. .. .. .. .. .. .. .. .. .. .. .. .. ..
Payment Authority (if any issued) No. & date .. .. .. .. .. .. .. .. .. .. .. .. .. .. .. .. .. .. .. .. .. .. .. .. .. .. .. .. .. .. .. .. .. .. .. .. .. .. .. .. .. .. .. .. .. .. .. .. .. .. .. .. .. .. .. .. .. .. .. .. .. .. .. .. .. .. .. .. .. .. .. .. .. .. .. .. .. .. ..
Descriptive Roll / Identification Documents with Photographs. (iv) Date upto and for which above rate of pension last paid. 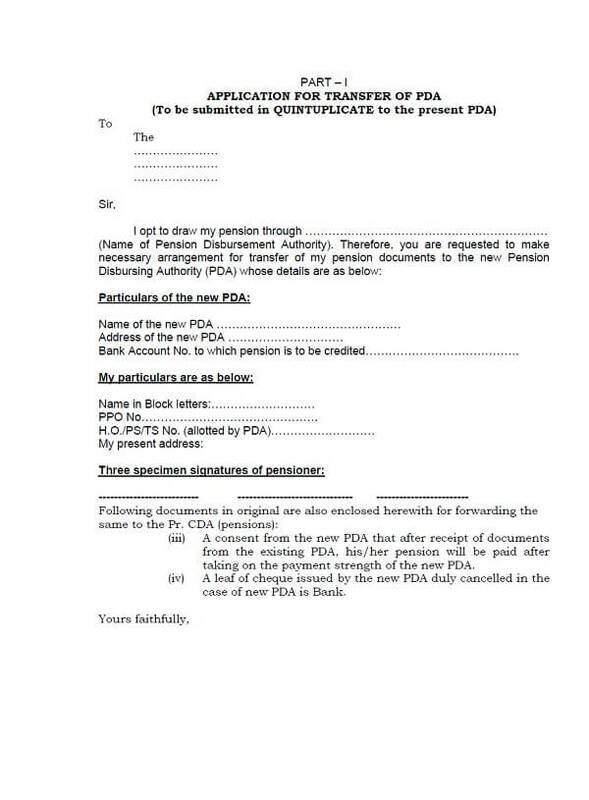 Undertaking given by the pensioner / family pensioner to recover over payment pension / family pension. The pensioner has been identified on .. .. .. .. .. .. .. .. .. .. .. .. by this office. 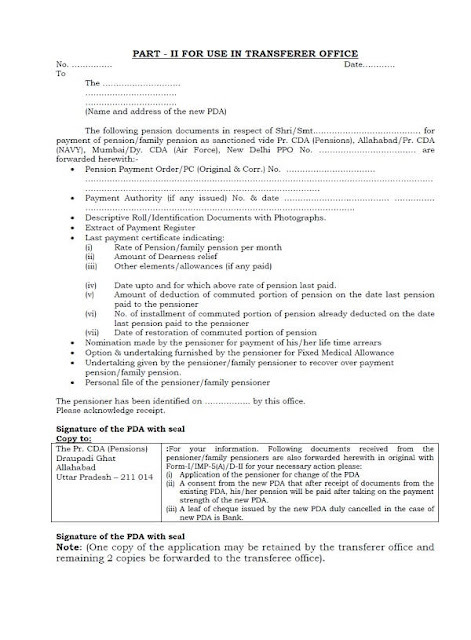 (ii) A consent from the new PDA that after receipt of documents from the existing PDA, his / her pension will be paid after taking on the payment strength of the new PDA. (iii) A leaf of cheque issued by the new PDA duly cancelled in the case of new PDA is Bank. Note: (One copy of the application may be retained by the transferer office and remaining 2 copies be forwarded to the transferee office). No .. .. .. .. .. .. .. .. Date: .. .. .. .. .. .. .. .. The .. .. .. .. .. .. .. .. .. .. .. .. .. It is certified that Shri/Smt .. .. .. .. .. .. .. .. .. .. .. .. .. .. .. .. .. .. .. .. .. .. .. .. .. .. .. .. .. .. whose PPO No. .. .. .. .. .. .. .. .. .. .. .. .. .. .. .. is holding Bank A/c No .. .. .. .. .. .. .. .. .. .. .. .. .. .. .. (in the case of transferee PDA is Bank) in our Bank. 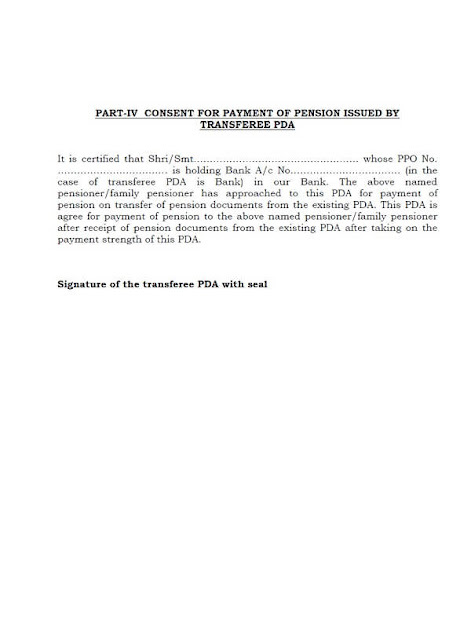 The above named pensioner/ family pensioner has approached to this PDA for payment of pension on transfer of pension documents from the existing PDA. This PDA is agree for payment of pension to the above named pensioner/ family pensioner after receipt of pension documents from the existing PDA after taking on the payment strength of this PDA.